In this case, the discontented is me. You see, Fordism works like this. Imagine a big game of economic musical chairs. Since the population of players is increasing, the number of chairs must continually increase by a more-or-less similar number. So – the number of players and the number of chairs increase in a +/- linear fashion. The ghost of Adam Smith is playing music, and that’s the growing economy. But at some point (usually never noticed until it’s past) the number of chairs stops increasing. Then, to “create new opportunities” or just to keep everyone on their toes, Smitty stops the music. Everyone scrambles for the available seats in a Malthusian rush. And sometimes, someone’s spread too thin – is so busy dancing to the ghastly music of Adam Smith that they are caught unawares by the stopped music. Liabilities in the wind and leveraged to the hilt, they stand and realize that there are no seats left. In this case, the discontented is me. I am a statistic. A dot on a chart in Milton Friedman’s Powerpoint presentation. I am soon to be unemployed. “Above” and “Below” (see my last post) require differentiation – and SALT looks like a rumination on the entire universe through the examination of the flattest of conditions. Pedreres de s’Hostal is a quarry in Minorca that is being turned into a heritage site. Even in pictures it is breathtaking. To provide upward building, we often must destroy correspondingly downward. To provide elevation of the spirit, we must acknowledge there is a raw material of the spirit… Imagine where the stone taken from here has been dispersed. Imagine how, with proper indexing (forensics at this point) it could be reassembled. Spaces like these are as much a part of the human legacy of progression (if not progress) and extension of our bodily, mental, and spiritual selves as the products of their harvest. Funny, all this talk of spirit coming from a committed agnostic… What else could you call this besides a “gestalt.” The application of this term to a condition like this, while probably accurate, was taught by someone whose influence I reject. Any way, these literal Land Marks need to be preserved, we need to be reminded of the devastation of our values. The damage already done, we should reclaim the space. And conceptually, these spaces allow for activities previously unrealizable. It became clear, but only after a considerable time, that this was a community organized around the activity of mining, of cutting and digging into the earth, for its own sake. Strip mining is the application of Fordist production to this above / below gestalt. Those wacky Germans, along with their spirit that says “We’re sorry for all the trouble we’ve caused” have established a reminder of this legacy, Ferropolis. I am intrigued by the nature of our interventions, whether they are intentional or honest or not, and I did a (poorly documented) project dealing with these issues when I was in college, proposing the establishment of an archaeological research institute to dig into the desert as a contemplation of human occupation.. Finally, I leave you with another thought, originally to be its own post. Here is the hole left by the halted construction on Santiago Calatrava’s Chicago Spire. I’m not going to give the “future” building any press, so if you want to see what it is supposed to be, follow the link. The power of Anish Kapoor’s Cloud Gate in Millenium Park in Chicago is that it contextualizes the viewer. On the outside face of the sculpture, you are small, and cast against your surroundings, on a convex surface that locates you within … well, everything. From the sky, to the very way the sculpture meets the earth. Now, if you’ve walked around this dazzling sculpture, you probably did what I’d imagine you’re supposed to, you got to the punchline by walking under it. Here, you understand that after emphasizing your smallness, your insignificance, your context; Kapoor intentionally or not puts you and the whole community of people underneath it at one time at the heart of Cloud Gate, a reminder that the people are what makes the City of Broad Shoulders. 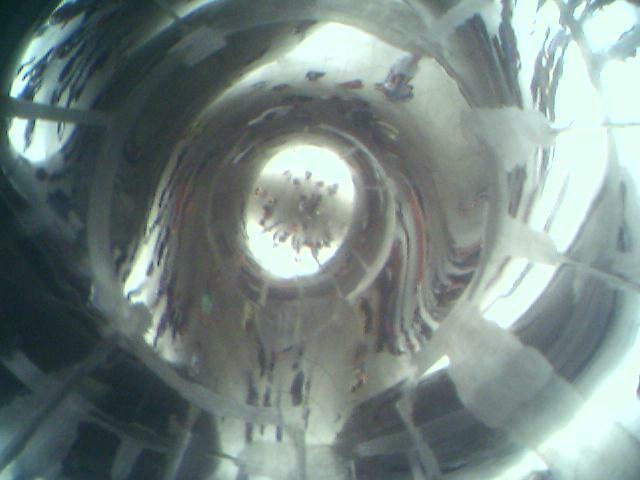 Now, Imagine Cloud Gate from Millenium Park suspended over the pit. Suddenly, the negative, the void of our loftiest technological aspirations becomes a reflected and distorted object in the face of the Cloud Gate, at providing an incredible double acting condemnation and glorification of our aims. That is everthing Pedreres de s’Hostal can be about. Everything that the Archaeological Research Institute can be about. Heidegger watches as we stare into the abyss, and as it – affirms us.